On Monday, July 24th, 2017, the Thames Road - Elimville Community Park Committee was pleased to host the Communities in Bloom Judges, as well as various community members, for supper for the second year. At this supper, the seven winners of the Canada Day flower bed contest were announced and awarded their prizes. Our Barn Quilt: "Cameron's Legacy"
me and check out the latest addition to the park: a barn quilt. 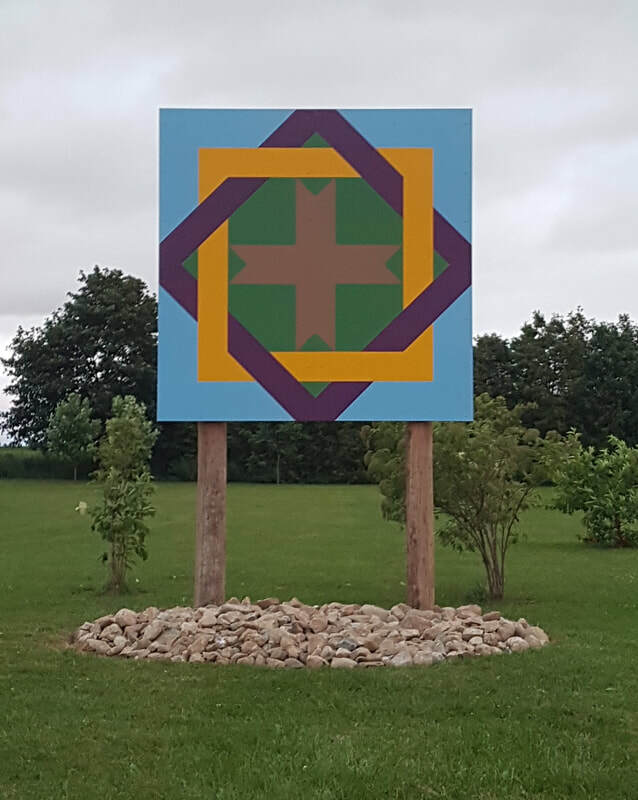 This quilt was made by the Thames Road - Elimville Community Park with the invaluable help of Tom and Bev Prout and erected with the assistance of several community members. There is great meaning behind the quilt pattern. "The history of this rural community park dates back to 1924 when 5 acres was given to the former Thames Road Presbyterian Church for the children as a recreation area. Over the years, the church name changed to Thames Road - Elimville United, but the church folk continue to look after the park. Surrounded by farms on a busy tourist road through South Huron, revitalization began in 2011 to make it a gathering place for area families and travellers passing by. To tell this story, our quilt design needed to capture what the park has meant to this community. The square represents the parkland and a diamond for the long history of youth playing baseball at the park. The two intertwine symbolizing the connection between community, church and families supporting the children. Purple and gold were chosen to reflect the former Usborne Township colours. In the centre is a cross for the faithful stewardship of the church at the crossroads of Thames Road and Elimville Line. The sand colour reflects the playground where the children are beckoned from the north, east, south and west to come and play in God’s outdoor arena. Naming the quilt block was an easy task. “Cameron’s Legacy” honours Thomas and Margaret Cameron, who donated the land with their vision of blue sky, green grass, children, faith and families interconnecting to build community." On Sunday, July 3rd, 2017, approximately 75 community members gathered together for the 3rd annual Fireworks and Wiener Roast in the Park. Lots of fun was had by all! The Timber Frame Picnic Tables Have Arrived! July 26th also brought with it the arrival of our two unique 10 foot timber frame picnic tables that provide plenty of seating for those who stop in and match the pavilion perfectly. We are looking to fundraise for two more picnic tables that will be specially built to be accessible to those in wheelchairs and walkers. Please contact any of the committee members to make a donation. The finishing touch was added to the pavilion when the grey metal roof was installed the week of July 11th, 2016. Not only does it look great, but it brings with it some shelter from the sun and rain. It's there ready for your next picnic! Special thanks to Agway Metals, Inc. for the donation and the Black River Timber Framing crew for their work. Join us for the 2nd annual Canada Day at the Park. Meet at 8 p.m. for a wiener roast and campfire. Wieners, buns, condiments and smores will be provided. Bring your beverage, lawnchair, wiener/marshmallow roasting forks, and some fireworks to pool together for the display at dusk. This is a no-fuss community event so tell your neighbours, bring your kids/grandkids, and spend an evening at the community park. 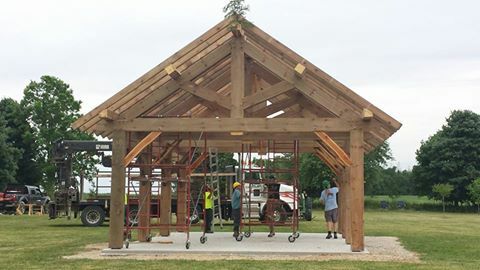 On Saturday, June 4th, 2016, years worth of planning and fundraising came to fruition when the community came together to construct a timber frame pavilion at the park. The unique pavilion, whose roof is yet to come, is a great addition to the park. Special thanks to Rob Geoghegan-Morphet of Black River Timber Framing for lending us his expertise to make this project a reality! We couldn't have done it without you! Watch a time lapse video of the pavilion build courtesy of Chad Smith! On March 5th, 2016 members of the Park Committee and the South Huron Community participated in a Timber Frame Workshop. Not only did they get to see how the various posts were prepared, but with the help of some experts, they were able to actually help in the preparation of the timbers that will be used in OUR pavilion! It was a great experience. Take a look and get a sneak peak of the progress of the pavilion. The Thames Road Elimville Community Park received a piece of the pie recently with the announcement of a $5000 grant from Libro 2015 Prosperity Fund. The presentation was made at the Exeter branch and was one of 31 community projects Libro Credit Union invested in across southwestern Ontario. The money will go towards buying logs and preparing them into timbers for the new pavilion at the park. Community volunteers will build the 20 x 30 foot timber frame structure in one day on June 4, 2016. 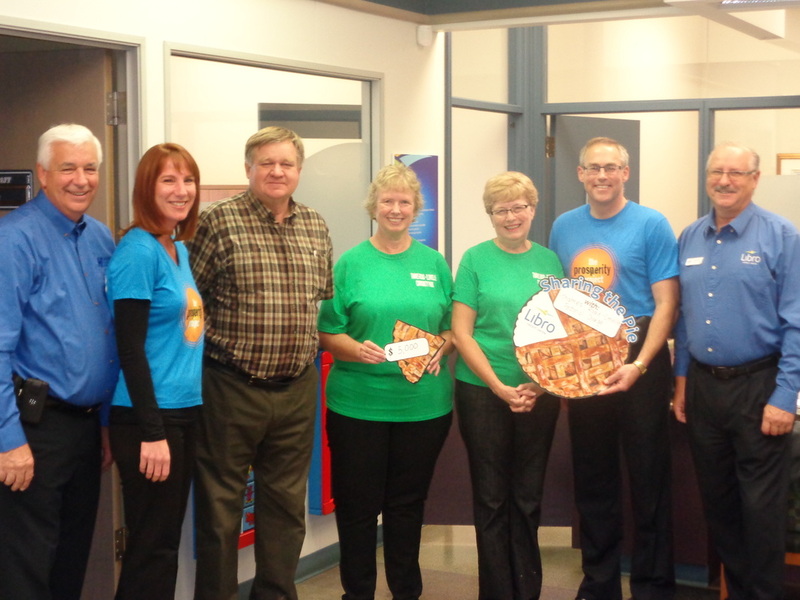 Sharing the pie are (left to right): Jim Deblock, Director; Benita Ruby, Stratford Branch; Jack Hodgert, Beth Cooper and Judith Parker of the Park Committee; Marty Rops, Regional Manager; Dave Marshall, Director. An appreciation evening was held recently at Thames Road Elimville Community Park thanking donors who have contributed materials, equipment, expertise and time to rejuvenating the park over the last three years. Pictured at the entranceway are back row left: Amy & Barry Parsons, Ryan Parker & Gracie, Karen Etherington, Charles Kernick, Mervyn Erb, Jack Hodgert, Rick Parker, Mary Lou Thomson, Tony Drinkwalter, Rob Morphet of Black River Timber Framers, Jennie & Pat Girard, Suzanne, Jaden & Raelyn Cann. Centre left: Jeanette Parker, Erin Parsons & Ben, Tom & Cathy Seip, Connie Kernick, Greg & Tracey Bahro, Larry, Sharon & Brett Lynn, Marg Stewart, Agnes Bray. Front left: Nicholas, Janelle, Katelyn & Percy Parsons, Rhett and Jace Bedard, Natalie and William Parsons. The committee would also like to recognize donors unable to attend: C.E. Reid & Sons Ltd., McCann Redi-Mix Ltd., MacLean’s Hone Hardware, Borland Farms, Hurondale Excavating Ltd., Gardiner Farms, Jake Kinsman, GreenCare Landscaping, Huron Seeding, Chad Smith and Brad Gregus. The committee announced the one-day build of the new timber-frame pavilion will be Saturday, June 4, 2016 with the 20’ x 30’ cement pad being installed this fall. Donations are still welcomed for this project. 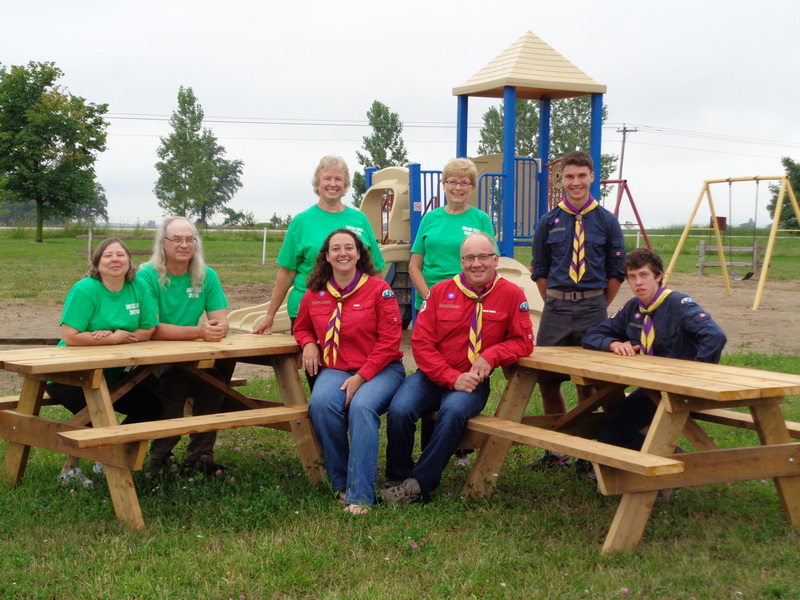 The Exeter Venturer Scouts recently constructed and delivered two picnic tables to the Thames Road Elimville Community Park. This is a new project for the scouting group who are raising funds towards attending future Jamborees in Canada and US. Pictured in front are Scout leaders Helen Turner and Marty Krebs. Back left are park committee members Kathy & Robert Bray, Beth Cooper, Judith Parker and Venturers Carter McGregor and Evan Krebs. The park committee was thrilled to support the youth in their project and will use a donation received from the former Exeter Agriculture Society to pay for the tables. In preparation of the cement pad going in this fall, the stakes outlining the pavilion size and location have been set. CANADA DAY AT THE PARK! : Wiener Roast and Fireworks! TIME: Campfire will be going at 8 pm, but come anytime so kids can play. SUPPLIED: pop/juice/water; ketchup, mustard, homemade relish; serviettes. Fireworks will be pooled together for a show at dusk. What a GREAT night celebrating Canada Day! Glowing bonfires, spectacular fireworks, delicious food, kids running around, and neighbours near and far coming together. Thanks to everyone who came out! 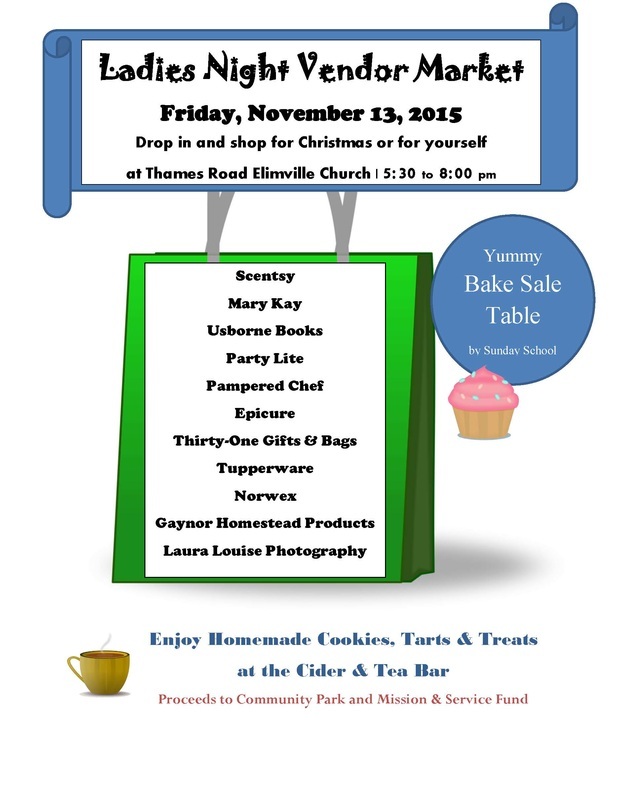 The Thames Road - Elimville Sunday School will be hosting a yard sale and bake sale at Miller's Country Store during the Exeter Town-Wide Yard Sale on Saturday, June 20th in support of the "pavilion project". There will also be a BBQ for both breakfast and lunch. Make sure to stop on by as there's sure to be something for everyone-- not mention some delicious food! Thanks to everyone who purchased a rain barrel! Your support is greatly appreciated!